Mrs bin and I were never very happy about using this still. 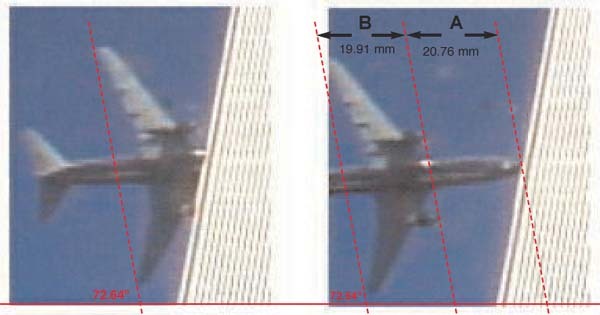 It's small and not very sharp but it was the only shot we had of the plane that hit the South Tower taken from underneath. Even so, a rudimentary analysis seemed to indicate that the proportions were all wrong for a blunt-nosed 200 series, a major contradiction in the "cavemen did it" theory. The still is a blowup from a video taken by ABC News. There is a certain amount of blur which, in my opinion, would imply it was recorded on analogue media (either film or video), e.g. it is not too clear where the nose actually begins, ditto for the engines. The shutter on a conventional film camera opens for a fraction of a second and records all it sees. If, as in this case, we have a fast moving object, the camera will record a blur. Of course, the whole business is a subject for hot debate on many internet forums. 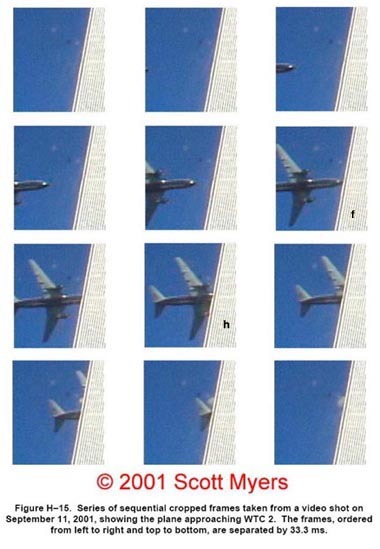 Someone on Democratic Underground attempted to counter our site, and its many photos of strange objects attached on the plane's underbelly, with this photo from an Interim Report by the National Institute of Standards and Technology (NIST) (be warned this is an 8 MB pdf). Now, far be it from me to find fault with the NIST, but I think they've been diddled. Sure, the bulge seems to be missing here, but the shadow between the wings doesn't seem convincing. (See bigger version of same photo here). It looks altered and has a slight reddish tint. And there's still the long pipe running down the fuselage. However, that's not what interested me when I saw this. After our previous exercise we were on the lookout for a crisper picture and this was it. Better, these stills seem to have been taken on digital video. In contrast to analogue video, digital video takes sharp stills that are not dependent on how long a mechanical shutter stays open. You notice this when watching sports on TV. Instead of the motion blur from analogue producing a smooth movement on screen, digital video produces a series of jerky stills when an object, whether player or ball, moves quickly. And casting my eye on the stills, the nose continues to look too long for a blunt-nosed Boeing 767-222 like plane N612UA. Go to the Scott Myers site and check that we're talking about the same event (you'll see the plane for a brief second halfway through the video). If you have a fast line pick up the NIST report and go to page 33 (remember, this is an 8 MB pdf). Alternately go to http://home.comcast.net/~catqueen/new_pa1.jpg for an off-site version of the above set of frames. Now, we don't have a still showing the whole plane, so we'll have to use our ingenuity. 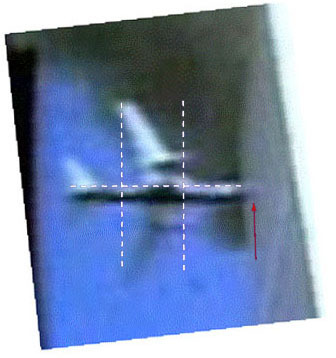 Take frame "f", showing the front of the plane, and frame "h", showing the back, and paste them next to one another in a Photoshop document. The graphic tools in Photoshop are not too great, so import the two stills into something like QuarkExpress (failing that, print the document and follow the steps but with a ruler and pencil). Of course, doing a dimensional analysis like this is like walking into a minefield. A thousand people could repeat the process and you'd be lucky to get two sets of matching figures. "The World is Wide", says my friend Walter paraphrasing the Heisenberg Uncertainty Principle. So to prevent any quibbling, the figures shown represent the lower limit values for the ratio A:B. In other words, we've been as generous as is reasonably possible in defining the distance B (the left-hand line barely touches the rear wing-tips, while the middle line has been set just past where the leading edge of the wing meets the fuselage) and strict in defining A (the right-hand line is set where the nose touches the building, though it clearly goes beyond this point). Nevertheless, this still gives us a value for A that is greater than B. There may also be a difference in dimensions depending on how the images have been obtained. Though irrespective of the method employed you'll still get a value for the ratio A:B that is greater than 1. The Scott Myers frames were obtained from the CatQueen JPEG. This is at 26 pixels/inch, so the resolution was raised to 72 pixels/inch for importing into QuarkExpress to give the quoted figures. When clipped and sent back into PhotoShop this gave a JPEG of 766 pixels width, this was reduced to 600 pixels in the above picture for the purposes of page layout. 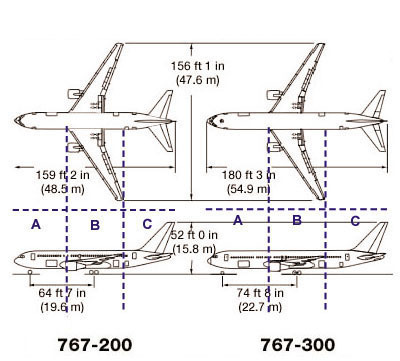 As we saw in "The Wrong Plane", the nose section of a 200 series, A, is shorter than the wing assembly, B. Whereas for the 300 series A is longer that B.
Ergo: The plane that hit the South Tower was not N612UA. It was not Flight 175!